Welcome to the TextBiz help page. What is on the home page? What is on the company page? 1. Search & Browse: Enter a ticker symbol to go to the company page, or just a part of the company name. Hit the browse button to browse by sector / exchange. 2. Theory / Help: A recap of the theory behing the TextBiz analysis is provided by pressing the Theory button. Help button brings you to this help page. 3. Companies of the week : The companies that had the biggest price change (good or bad) during the previous week are the "Companies of the week". Note that the change is weighted by the size of the company, so small companies with huge changes in their stock price won't make the front page. 4. US Markets : The composite indices of the 3 main US exchanges are shown with their weekly and YTD change as well as the random walk graph. There is also a listing of the largest companies for each exchange, sorted by current market capitalization. 5. Major Indices : The three most important US Indices with weekly, YTD change and random walk graph. 6. 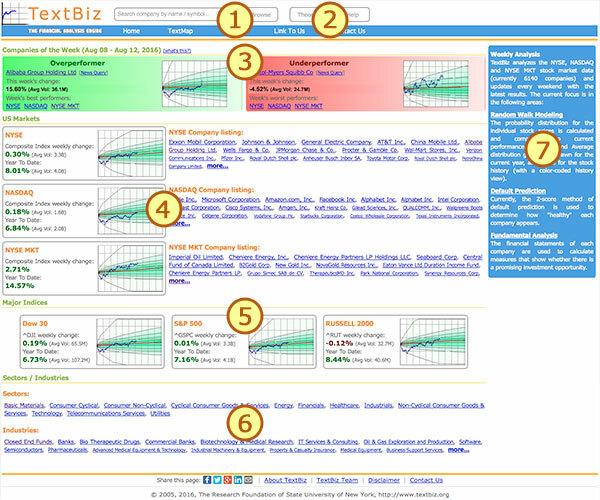 Sectors / Industries : The 12 sectors and the 5 largest industries are listed on the home page. 7. Synopsis : The current scope of the TextBiz website. 1. Company profile : A list with the basic information about the company. 2. Side Bar : At a glance view of the prediction percentile for each year in the stock history. More info on the topic below. 3. Predicted Price Distribution : The graph shows the probability for every possible price during the year. More info on the topic below. 4. Predicted High / Low to Date : The blue part of the graph shows the probability for a price to have been reached by some date in the future. The red part shows the probablility for a low to have been reached. More info on the topic below. 5. Z' Score : Based on the company financial statements the Z' score that shows the health (or possibility for default) of a company is calculated and graphed versus the entire industry or sector z scores. More info on the topic below. 6. Z', Z'' Score : Similar to the above but mainly intend for privately owned companies. 7. Fundamental Analysis : A wide range of fundamental analysis measures are calculated. If you want to learn more about random walks, you can checkout the theory Here. Note that the average historic volatility (Parkinson High-Low) is calculated using the previous year's quotes. A standard drift of 7% is always applied to the calculation, which is the growth we get if we see the stock market at a historic perspective (i.e. Dow Jones Industrial index for over half a century). As for the closing prices, we always use adjusted values. Throughout TextBiz, adjusted close prices are used. The adjustment is done to cancel out the effect that stock splits and dividends have to our time series. For example, let's say a stock costs $40 and the next day is split 2:1 (meaning for each 1 stock you get 2 of the same value) and that the next day the stock costs $22. Since you now have 2x22=$44 dollars worth of stocks, the price actually went up. It is obvious we cannot use actual close prices for our modeling. We will have to "travel back" the time series, starting from today multiplying by the cumulative adjustment for each time period. For example if 5 days ago we had that 2:1 split, prices from that point of time and backwards are adjusted by 0.5. If 100 days ago we had another 2:1 split, prices from that moment on (or back in time) will be adjusted by 0.5x0.5=0.25. If a year ago the stock paid a dividend, we calculate the dividend as a percentage of that day's actual price, we subtract it from 1 and multiply again with our cumulative adjustment factor for that point of time. There is only one "catch" with the Adjusted Close Prices used in the website. Normally, only the current years Price Distribution (Random Walk) graphs are recreated every week, in order for them to be current. To save processing power, the previous years are not recreated that often, even if the adjusted close prices have changed. So, you might see some graphs whose prices might not be directly comparable to the current stock price due to a split, but the analysis for that year is still valid. If we later decide to devote more processing power, there won't be such a case. The color of the year buttons in the left sidebar reflects the performance of the stock compared to the expectations as derived from the Random Walk distribution graphs. The more the button deviates towards the red (from the neutral gray), the worse the year was for the company, while green indicates a "good year". Note that the years that have exactly 0% or 100% probabilities are marked by dark gray, as their behavior during that year is not considered normal. We calculate the Z scores for all companies to get an idea of their "health". Two graphs are provided, the first plots the company in respect to the sector and the second in respect to the industry. The company score is noted with blue letters on the graph, and a blue vertical line. Scores less than 1.8 (red area) are considered to indicate unhealthy companies, while the companies with over 3 (green area) are considered healthy. The scores are only calculated using the annual reports, as they can vary wildly with quarterly statements due to various accounting events such as write-offs etc, which is why usually the last year's score (based on the Dec 31 statements) is highlighted. The Z' and Z'' scores are mostly not intended for public companies, but they are provided for reference. We can use the financial statements of a company to find out a lot of information about it, and decide if it is a promising investment. The various measures that are calculated, are describe in the theory section Here. Every week, two companies are chosen as interesting for their positive or negative performance during the previous week. The companies are chosen by a formula that takes into account the weekly change in the price, as well as the size (market cap) of a company.